When the viral product incubator FCTRY needed badass viral marketing, they reached out to us, BAMF Media for help. And when we needed the right software to run this viral campaign, we knew that Viral Loops was a one-way ticket. R U ready to shine? We designed and coded a unique viral website with custom referral backend technology integration through Viral Loops, which produced amazing results for the campaign. The “Thank You” page was optimized to drive referrals — 48% of people who signed up shared one of the referral links. One of our best growth hacks was using PR and media coverage to drive the top of the campaign’s viral funnel with high converting free traffic. We managed to land stories on Mirror Online, PopSugar, Bustle, and several other major publications. At BAMF Media, we are obsessed with virality metrics. 3 people signed up for every 2 social shares. One of the campaign’s top performing ads saw about 90% of leadsand 2,601 shares. The average click-through rate on Facebook ads in the beauty industry is around 1.16%, with a cost per click at about $1.81. Unicorn Snot’s campaign saw a CTR of 2.7% and a CPC of $0.10, so we managed to produce a significantly higher click-through rate for a fraction of the cost as a result of some badass creative assets and audience targeting. Twitter saw the highest share/referral ratio — 46% of shares resulted in a referral. As far as shares, Facebook was where the campaign took off — 25%of shares resulted in a referral, but it had 3X more total shares. The majority of our tracked referrals came from people who clicked on a shared link outside of Facebook, Twitter, or Email — which could’ve been from other “discount websites,” or PR placements sharing links to larger audiences. These virality metrics are key to a successful Viral Loops campaign. Note: If you want to learn more about viral and referral marketing metrics, you HAVE to read From Visitor to Ambassador: The art of referral marketing. Having the right milestone incentives and rewards is also key. If people who sign up are not stoked to share and get that prize, you simply won’t go viral. Give customers what they really want. And be willing to spend some money to do it. Branded stress balls and t-shirts won’t do the job. For example, Gilt developed a comprehensive insider program to encourage referrals. In order to capture to their broad customer base, they didn’t just go with one incentive but instead established a tiered system of rewards including everything from free merchandise to insider access to their best flash sales. 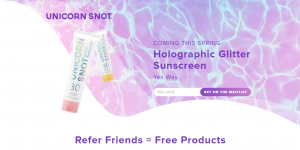 A milestone referral (like the one that we used for Unicorn Snot’s campaign) structure should always be tiered – with easily attainable milestones up front and a super strong emotionally compelling grand prize that is relevant to your product or service. 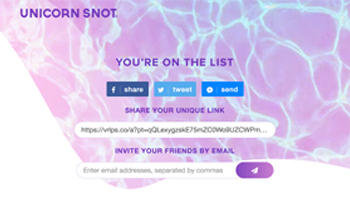 By the end of the product launch waitlist campaign for Unicorn Snot, over 200 people had referred more than 25 friends, which would come to more than $20,000 in additional prize costs. So, make sure to think about your reward incentives and the potential costs should your campaign take off and many more people reach those milestones. The discounts you offer can make or break your campaign. You can bring in a lot of customers with huge discounts, but if those cost you more than the campaign brings in, it might not be the wisest move. After working on so many viral marketing campaigns, we know that some clients and products are more difficult to promote than others. 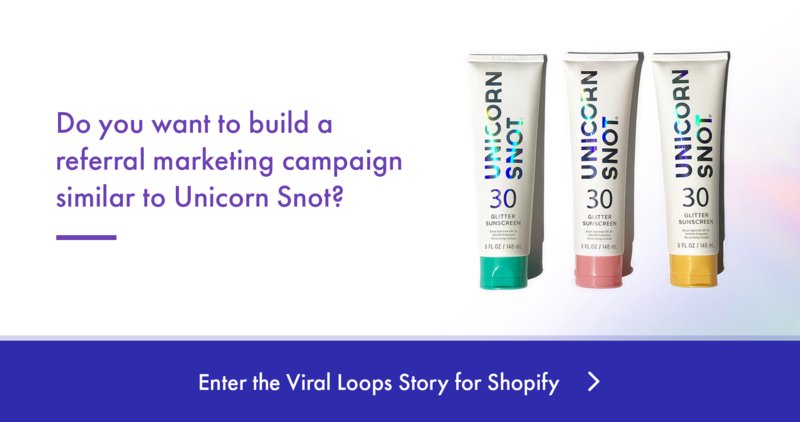 Starting with a unique, high-demand product like Unicorn Snot made the process much more successful for BAMF Media and our campaign. We were able to combine the natural intrigue of glitter sunscreen with the creativity and skill of our team to launch an awesome viral marketing campaign.